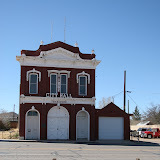 This was a neat little town; the entire town is a National Historic Site. We had lunch at “Big Nose Kate’s Saloon, Very good sandwich and live country music. After lunch we took a walk down the Bird Cage Theater, listened to a very good dissertation on it’s history. The name Bird Cage came from the small opera type balconies that went around the walls overlooking the casino. This is where the ladies would take their gentlemen guest for private entertainment, making it private by pulling the red drapes to screen it from the casino floor. It had the original bar with all the mirrors intact.